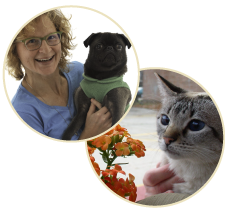 Dr. Lisa Olson has been practicing small animal medicine in Madison, WI for the past 17 years. She is a graduate of the University of Wisconsin School of Veterinary Medicine, 1999. While her formal training is in conventional medicine, Lisa has a strong interest in other modalities, continuously learning about new and alternative therapies to incorporate into practice. She supports the other doctors in offering a mixture of Western and Eastern medicine to her patients. She also works part-time for Veterinary Information Network, an online information resource for veterinarians. Special areas of interest include geriatric and wellness care. She has also volunteered with several different animal rescue groups. Dr. Olson is a member of various veterinary associations including AVMA, and WVMA, and has spent a great deal of time volunteering for rescue groups such as Shelter from the Storm and Angel's Wish. In her spare time, Dr. Olson enjoys spending time with Fred, and their two dogs and four cats. She likes to get outside into the fresh air! and go for long walks with the dogs.